Got too many events to attend, but running short of beautiful jewellery to complement your outfits? Svapan Creations is your one-stop destination for all kinds of ethnic-fusion jewellery—at a pocket-friendly price. No matter how understated your look might be, statement jewellery can add the right amount of drama to it. For all you women out there who are always on the go and don’t like layering your jewellery— you must check out their collection. 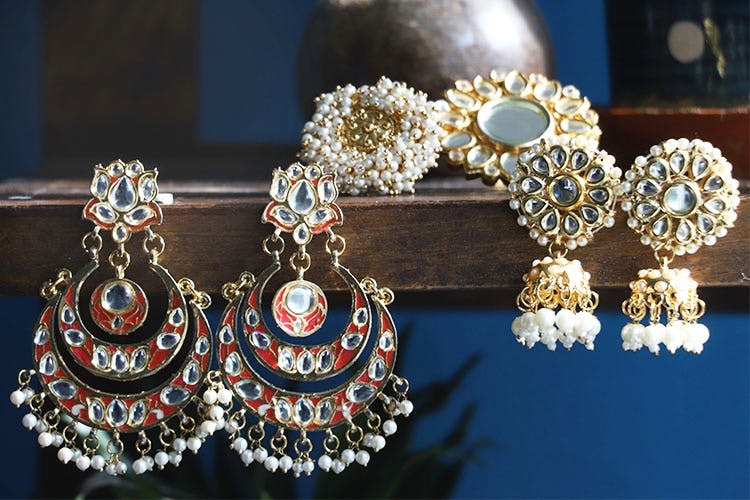 We are crushing on their kundan jhumkis with delicate pearl detailing that can be paired with both plain, solid kurtis and more contemporary outfits. The Red Chandbalis with their beautiful meenakari work are perfect for a summer oufit. Wearing your hair down or in a messy bun? This pair of stunning earrings will add a touch of class to both. You must also look at the Chunky Pearl Ring, that goes well with opulent textures, such as satin or silk—it’s a fun, stylish statement piece. If you ‘re big on over-the-top rings, then the Mirror-Work Cocktail Ring will help you with all your last-minute touch-ups. Jewellery shopping can be easy, both in terms of effort and in terms of how much you spend. Get your hands on your favourite jewellery at an extremely special price with LBB specials.